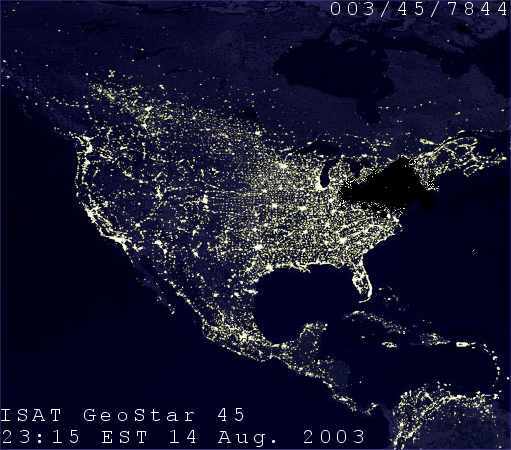 Here is a satellite view of the blackout last weekend, from New York City to Detroit. Click on the picture for a larger version. The only problem is that this image, which has been going around the web this week, is a hoax. See http://www.breakthechain.org/exclusives/blackoutsat.html where this photograph is analyzed. The picture was doctored. Below one of our readers, Gayle Lelyveld, explains what it was really like. She was there. 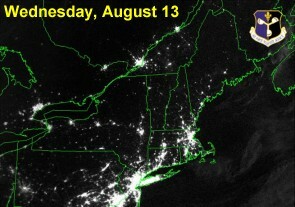 I live and work on Long Island, and this blackout happened while I was still at work. I hear this thunk like somebody is playing with the lights and the computer. Unlikely, but being a woman of a certain age, I have to make my suspicions known - "Who in Hell is playing with the lights?" I hear all around me, "Are you out?" "Yeah, nothing on the screen." Everybody is screaming at each other and into their cell phones. Somebody has their cell on conference. It's somebody in Queens. They still have power; now they don't. Now the word is out. 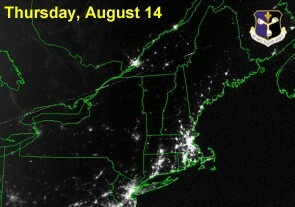 Everybody from Canada to New Jersey is out from Michigan to the Atlantic Ocean. I have to sit down to figure this one out. It sounds like I have to spend two hours in the car of the one guy in my office who lives in my town who takes the damned longest way to get home. I don't own a car; I normally take the Long Island Railroad from Mineola to Farmingdale - meeting a shuttle bus that puts me down with a ten minute walk from work. I am in great shape. However if the traffic lights don't work, the bus does not come in time, if there is no electricity anywhere, the train does not come? So I take the ride. Naturally it is slow because the cops haven't been able to get to the major intersections. It takes a half hour to get to the Long Island Expressway, which is two minutes away. We meet up with an SUV that really does not want to let us in, but it must be new because we push our claim and we get in. My land folks want to know what's going on. Mostly when the power is going to be back on. They got the basics from the car radio, but they don't want to run the car all night because two of them are hospital workers and they have to get to work the next day and can't run down the battery. We sit and visit until the sun goes down, when I decide that going to bed early may be an idea whose time has come. Twice during the night, I consult my cell phone for the time. At one and at four thirty. I look at the phone, which is a fax machine. I decide on a plan a and a plan b. Plan a: Lie in bed until the sun comes up and read a book in the park. Plan b assumes electricity. It is get up and go to work. At five-thirty electricity comes on as evidenced by the moving paper in my fax. Plan b it is. The Long Island Railroad is not running. It has to wait for city power and then a check of the system. I have to take the bus. I don't have the money for a transfer. That is in the bank and the ATMs do not work. I ask the black man who told me the trains aren't running for a quarter for a transfer. He gives me one. I start for the bus terminal. On the way I run into a woman who has just arrived by bus from the city where she's been since yesterday. The railroad had set up a bus deal to take everybody home. The route was from Penn Station to Freeport to Babylon to Ronkonkoma to Farmingdale etc - to Mineola. Boy, was I lucky. I get to the bus to Hempstead almost missed, but he figured me out as I stopped and made a face. Not many on this bus, but the seventy was really full. A nice young man got up for me - it pays sometimes to be over fifty, and I gave it back to him as the bus emptied out. This wasn't my usual bus, and it stopped about a mile from my job, but I had to get off at this same stop on Monday - so I was prepared for the walk. This time it was early in the day so it was pretty easy. Off I get and cross the street and start my walk. As I go along, I notice people standing outside buildings waiting to get in. I figure they are waiting for people with keys, but that is not it, they are waiting for the electricity to open electronically locked doors. As it gets closer to eight-thirty, the more people are waiting outside the buildings. I get to an intersection of a usually busy street, but have no trouble crossing. That should have been a clue. Oh well. I take a right and walk to the next street not very far. I cross to the side with the side walk, and head straight on. This is the street my job is on, and I'm on the right side. Suddenly somebody is calling my name. I turn all the way around to find a friend from the office in a SUV across the street. The office was closed. The electricity didn't come on yet. I got a ride to the train station near him where I could get a bus back to the Minneola train station. There I stopped for a second breakfast and walked home.